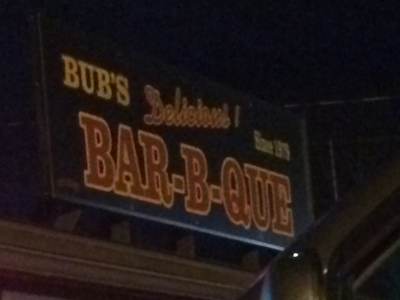 Bub's BBQ is a well known BBQ joint that has been around since 1979 in Central MA. Its very close to the UMass Amherst Campus, so if you are ever out in those parts check it out. They have a wide range of meat options, including brisket, ribs, chicken, and sausage (I've tried all of these). Their brisket is good. They slice it nice and thin and its very tender and smokey. They remove the bark on the brisket, which for some reason seems to be quite common out here in New England. I thought their ribs were the best by far. They are very tender and very juicy and have a great flavor. They don't quite fall off the bone, but they come off pretty easily. They have a good flavor to them even without sauce. The other big draw to Bub's is the fact that they have unlimited sides. They have a huge selection of hot and cold sides. They actually have GOOD collard greens (a rarity in the north). Honestly even if the BBQ was terrible I'd come back just for the sides!